Why would anyone think about volunteering when paid work is their goal? When paid employment is the long term goal our advice to do some volunteering isn’t always greeted with enthusiasm, but it should be. It’s a very positive step in several ways: establishing routines; workplace experience, developing skills to fill those blank CV spaces. And, if the work is well done, the potential of a good reference. All huge positives towards getting paid employment. Josh was a Catapult job seeker who could see the value of such an opportunity and was keen to take it up. “I wouldn’t have thought of volunteering but Mark [employment consultant] sorted it out and I was happy to give it a go. “In my situation, you know, because I’d been out of work for quite a while the experience was so much more important than being paid”. 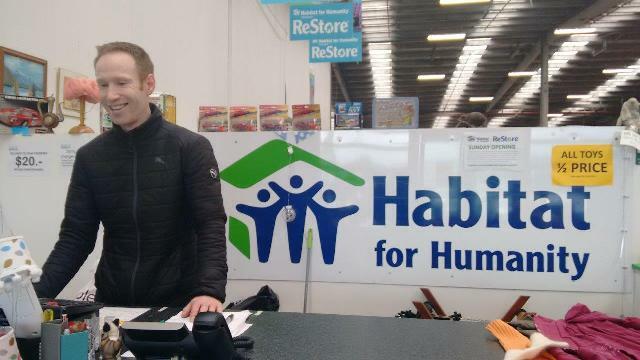 The organisation Josh volunteered with is Habitat for Humanity www.habitat.org.nz/ at one of their ReStore outlets. Taking on a new role isn’t always easy and Josh felt a bit concerned about what would be expected of him. However, he was determined to give it a go. Come the first day,Josh felt a bit apprehensive but after meeting the store manager any concerns he had were quickly allayed when she told him just to ask if he was unsure about anything. So, a great outcome for Josh who says that he got so much more out of his work there than just getting up in the morning and having a place to go. “Actually, the whole experience [with Catapult] that led up to the volunteering cleared things up more in my mind, now I can see more… it’s less obscure… I can see what I have to offer more clearly. It made me look at things more positively and that’s why I gave the volunteering a go“.